The Lord of the Rings: The Two Towers is a 2002 epic high fantasy adventure film directed by Peter Jackson and based on the second volume of J. R. R. Tolkien's novel The Lord of the Rings. 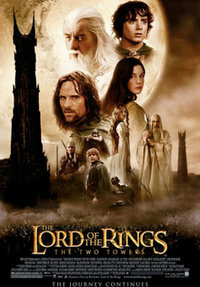 It is the second instalment in The Lord of the Rings film series, preceded by The Fellowship of the Ring (2001) and concluding with The Return of the King (2003). Continuing the plot of The Fellowship of the Ring, the film intercuts three storylines. Frodo and Sam continue their journey towards Mordor to destroy the One Ring, meeting and joined by Gollum, the ring's former owner. Aragorn, Legolas, and Gimli come to the war-torn nation of Rohan and are reunited with the resurrected Gandalf, before fighting at the Battle of Helm's Deep. Merry and Pippin escape capture, meet Treebeard the Ent, and help to plan an attack on Isengard. This webpage uses material from the Wikipedia article "The_Lord_of_the_Rings%3A_The_Two_Towers" and is licensed under the GNU Free Documentation License. Reality TV World is not responsible for any errors or omissions the Wikipedia article may contain.